A well known & respected member of the sign community, this business has traded continuously for nearly 60 years & now operates from a modern 15,000 sq ft head office & manufacturing base in Coventry in the West Midlands. 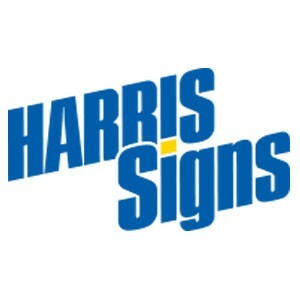 HARRIS SIGN GROUP LTD is widely recognised as a top quality sign manufacturer with industry leading QUALITY ACCREDITATION from LRQA to ISO 9001 – 2008. Specialists in MULTI SITE rebranding exercises & offering a turnkey package from initial PROJECT SCOPING, through in-house DESIGN & MANUFACTURE, culminating with on site INSTALLATION & REMOVAL & ongoing planned MAINTENANCE if required. Fully compliant to current DDA LEGISLATION, this is one of the few specialists in the complex area of TACTILE & BRAILLE signage, being approved suppliers to Local Government, Local Authority, NHS Trusts & Educational Institutes. The standard product range includes: Screen Printing, Digital Printing, Banners & Flags, Vinyl Lettering & Logos, Window Lettering, Security Films, Health & Safety Signs, Shop Fascias, Site Signs, Marketing Boards, Magnetic & Perspex® Acrylic Signs, Illuminated Signs, BS Road Signs, Routing, Engraving, Tactile & Braille. With expertise in vehicle livery, from a single van to the largest muti site HGV operation, this business liveried over 1000 commercial vehicles last year. Offering a true UK wide supply & fit service to key customers, Harris Sign Group Ltd currently has some 7,500 marketing boards out on site on a HIRE BASIS – please contact for more details of the services offered. The business benefits from current accreditation from CHAS (with regard to Health & Safety), CONSTRUCTIONLINE & CONTRACTOR PLUS & has been pre-approved for tendering in both the Public & Private Sectors. The Sales Team are contactable on: 024 7622 9950 Monday to Friday – 8.30am through to 5.00pm & would be delighted to assist you with your signage & design requirements or answer any queries you may have.